Ecclesiastes has been my "prayer book" these past weeks. 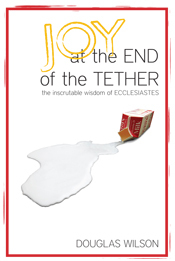 I have been studying it and to help me dig deeper into it, I have been reading Douglas Wilson's book, Joy at the End of the Tether: The Inscrutable Wisdom of Ecclesiastes. I am half way through it and I can already recommend it to you all. It has been a blessing to me. "The great Hebrew philosopher who wrote this book called Ecclesiastes calls us to joy, but to a joy which thinks, a joy which does not shrink back from hard questions. He calls us to meditation, but to meditation which does not despair." "The meaningless of all things, as Solomon presents it, must work down into our bones. We should let the Word do its work before we hasten to make Ecclesiastes a grab bag of inspirational quotes." "God is the One who gives things, and God is the One who gives the power to enjoy things.. Only the first is given to the unbeliever. The believer is given both, which is simply another way of saying that he is given the capacity for enjoyment." "To be wise, a man must know his limitations." "We are being told that we have been placed in a world that we did not create or fashion, and that this world has various repetitive cycles, to which cycles we have been assigned by someone else. We are under the authority of these repetitions and have been placed under that authority by the hand and purpose of God." "God only promised a way of escape from every temptations, not from every unpalatable doctrine." "When calamity comes, and the tears follow, the Lord was in it. When rejoicing brings relief, the Lord was in it. The doctrine has a hard edge and more than one person has cut himself on it. But denial of the doctrine does not remove the light and darkness, the peace or evil. It just removes the possibility of finding any solace." "Relationships which form under His sovereign will, and relationships which dissolve are all from Him as well (v.8). Euodia and Synthyche were close and had a falling out. No longer under the sun, they are together again. The time for the friendships and the time for the quarrels are all appointed." "Eternity has been placed in our hearts. God has made us in relation to Him, and nothing we can do will alter this. He is always our Maker and we are always made. He is always Creator and we are always created." "We must begin with God and not just any old divinity." "Rejoice, do good, eat your bread, drink your wine. Believe in the sovereign God and enjoy these inscrutable repetitions (3:15). This is a gift (3:13). Remember his judgments (3:15) and sit down to your dinner." Now, it's been a while since I have not hosted a giveaway here, and I am thinking that this is the time to do so, and this is the perfect book to give away. So if you want to enter the drawing, leave a comment here. The winner will be announced Wednesday, August 1st.